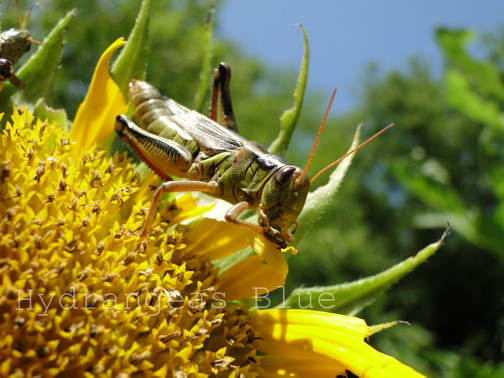 This is my garden dilemma: I have a grasshopper infestation. I need a natural way to get rid of the bugs, as I am an organic gardener. Attract birds that will eat them, is my first thought, but I have cats that go outside. If I feed birds in summer it’s only the hummingbirds. My cats would never be able to catch one of them. In fact, neither of my cats are big hunters, but I imagine that birds get nervous when they look down and see cats in the yard, so they move on. If the birds do end up eating the grasshoppers, they will be down near ground level. The grasshoppers are feasting on the leaves of many of my garden plants. If I put out feeders, I feel like I am inviting birds to their death, because of the cats. Summer bird-feeding can also attract black bears in my area. They love sunflowers and thistle seeds, and can apparently smell them from far away. Bears are not wanted in the backyard, for obvious reasons. I’ve lost bird feeders to bears when I’ve left the seed out too long in spring. If bears came now that my gardens are lush and growing, my vegetables and flowers would be trampled. I did look into which birds are insect eating, and bluebirds come up at the top of the list. I think I’ve seen one bluebird in my entire life. I do see Phoebes occasionally sitting on my tomato cages. A pair of cardinals flies through early in the morning sometimes, but I don’t know if they eat bugs such as grasshoppers. I guess I’ll just have to hope for the best and tackle the grasshopper problem next spring. Next Post Picking Zucchini Every Day Now!